Memtest is a small boot loaded program that allows a user to detect faults in his or her RAM . It comprises of a series of tests that puts the RAM under different stresses such as transferring different amounts of data across the channels quickly thereby testing how well it copes, and at the same time checking for accuracy and errors in the data transferred. Computer not booting at all, beeping endlessly. The computer may display just a black screen with the computer still being on or restarting. Also a POST beep may be heard which indicates hardware faults. There are different sequences of beeps and so research must be carried out to ascertain whether its a RAM fault or not. However remember different motherboard manufacturers have different POST beeps and so the correct sequence of POST beeps for one motherboard may not mean bad RAM on another. Distorted graphics on the screen. One of the stranger indications of bad memory. Ive seen so many users put this down to graphics cards. The user has then gone and bought themselves a new £100 graphics card to find out their £20 stick of RAM was the fault. This is a great point to which to use Memtest, just to make sure of the fault. Blue screens of death during the installation of Windows XP, Windows 2000 and Vista. This is an obvious sign of faulty RAM. A Blue Screen Of Death is an error screen displayed by some operating systems, most notably Microsoft Windows, after encountering a critical system error which can cause the system to shut down to prevent damage. As there is no driver that can go wrong here and other hardware wont have fully been configured, faulty RAM will be the reason for the error in most cases. General use of faulty RAM will produce a Blue screen. However again don't automatically assume this is RAM associated. There are hundreds of different items that could cause these symptoms and so diagnostics are required. Crashes during memory intensive tasks such as using Photoshop, playing 3d games etc.. When intensive programs are used there is a greater risk of hardware over-stressing itself, thus causing errors. This is actually an area of testing completed by Memtest to check for RAM stability. The general term for this would be stress testing. This is were hardware is put under extra pressure to perform large task. Faulty RAM would not be able to cope in most instances under this pressure thus singling it out as faulty. Now that you have diagnosed faulty (or the possibility of faulty) RAM you should carry on to set up Memtest. There are 2 versions to choose from but i will be using the CD version due to the easier and much quicker install. First Download Memtest from This Link. Click This Link to download 7Zip. Windows user require the Top link in the list for the .exe version. 64 Bit users should select the 64 bit version. Others users eg Mac Users should go to the heading below that says Some unofficial p7zip packages for Linux and other systems and download the relevant version. Download that to your desktop. Then double click the 7Zip installer and allow it to install on your system. Then click 7 Zip > Extract Here. Now Click This Link to download ImgBurn. Download that to your desktop and launch the installer by double clicking the ImgBurn installer icon. Follow the instructions, keeping the settings as the defaults. Next click the Browse for File button and load the memtest.iso from your desktop. Then click the large Write file to disk button . The program will then create your boot disk. First and foremost verify that your disk has burned correctly. Now leave the disk in the drive and shutdown your PC. Open the side of your Case and remove all but 1 sticks of RAM. You should only have one stick of RAM installed when running Memtest. Pull the white clips to the side and the stick of RAM should pop out. Turn your PC back on. Memtest should now boot. If not, go to the FAQ below. No more user involvement is required at this stage. Memtest will automatically start the tests. The images below show Memtest scans in progress. Once Memtest has completed its scan note down any errors that occurred. However usually you will be the one to stop the scan. You can stop the scan at any time but I would advise you run it for at least test number 8 as shown in the image below near the top right hand corner of the screen. Then repeat the steps above for the remaining sticks of RAM by opening the case and swapping the existing stick with the one that has not been tested and then re run Memtest. The image below outlines the various areas of the Memtest screen. The image below shows a system with failures within Memtest. As you can see in the left hand Column it shows the failures were all made within test 3. Any failures would normally lead you to have to replace the RAM module as its usually something that isn't repairable. This is the most common problem with Memtest and falls down to a problem in your BIOS. Turn off your PC wait 10 seconds and then Turn it on again. When your PC loads and gets to the POST screen it will say something along the lines of Press DEL (delete) to enter setup. See This Image as an example. 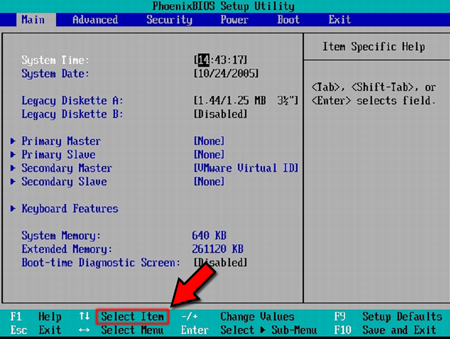 When you enter the BIOS use your arrow keys to move to either the Main, Advanced or Advanced BIOS Features Tab. You will be looking for a list that says Primary Master, Primary Slave etc. See This Image for help. Then change Primary Slave to Hard Disk or Hard Drive what ever is available. These tests are here to try and ascertain errors in your RAM. Some tests could come back as failing due to other reasons such as the program itself. Therefore the results will not be 100% accurate. Most errors found in Memtest will require you to replace your RAM. This is because the problems are found more in the hardware of the RAM and how it works. Therefore it would be difficult for the Average user to repair. Please see the Hardware-Components-Peripherals Forum for more help. I have more than one stick of RAM, does this matter? Yes. Being able to diagnose each RAM stick individually is important as only one stick of RAM could be faulty saving you money if a replacement is required. When scanning with Memtest make sure you only have 1 stick of RAM installed at a time to improve the scanning results. Thanks also to rshaffer61 for helpful advice and corrections given. Edited by rev_olie, 24 August 2009 - 05:23 PM. hi,many thanks for your guide. ok, this feels like a stupid question, but i've done it before and it worked so i'm not getting why i'm having this problem. The memory works, no errors, no problems. I bought a new chip that runs fine by itself, but it will not work with either of the other 2 chips i already have. But i put the 512 in with either of the 256 chips and it doesn't work. By itself, it works fine. The other two chips work fine as long as they aren't in the mb with the 512. I have 2 slots and trying to upgrade my memory cause we all know that 512 is bad and definitely not enough for even some everyday users who run anything flash based on their computer. Hello, good question, these ones are the kind that get me stumped from time to time also so you are not alone. Best bet is to make a new thread in the hardware section as specified above, and feel free to shoot me a PM and I will take a look for you, plenty of other Techs will see it also so you are bound to get an answer. got crazy busy and missed the comment but its a good one - making it clear that the program is not ever going to be 100% accurate. There are reasons for failures that software will never pick up and these are going to be situations where its just best to give up - but only clearly after a fight. If 2 sticks of RAM aren't working together there are a few reasons but not a shed load. The main areas to look are if they are a matched pair or not. Unmatched memory is a big problem in machines. As to why - well I don't really know - but having unmatched memory eg different vendors, speeds and types will cause issues. They do the same job but each in a very different way and by mixing the two, data is incorrectly handled causing leaks and problems. Also not forgetting that bad RAM isn't going to be the only reason a stick may fail. The motherboard and OS need to manage the memory and what goes where. On-board controllers and various chips do that job and if these are faulty again it can cause all sorts of miss matches. Let me know (pm, or forum message (making sure you tell me where it is!)) if you want any more help etc. Can't say I'm a memory expert but I can at least try. Hopefully it will give me a rock solid excuse to get on the board again! I ran memtest overnight on 2 memory sticks but when i got up the following morning i found my pc turned off, what could have caused this? The computer turning itself off is commonly caused by overheating or faulty PSU. Make a new thread in the hardware/components section and someone will help you out. But I never had my pc turning off before, it only happened when i ran memtest overnight. I know that memtest tests memory but also cpu L1 L2 and mobo, could a problem with other componets have caused the shutdown? Edited by vultus, 16 March 2012 - 01:36 AM. could a problem with other componets have caused the shutdown? Yes as Troy has indicated it could be caused by overheating or a faulty PSU. The timing of the problem could just be a coincidence with running memtest86. Starting your own topic would give us a chance to address your issue in your own topic away from a tutorial only topic. We're glad you got it figured out and thanks for asking about it.